Wood pellet smokers are the holy grail of homeowner cooking. They allow you to smoke all sorts of meats automatically at the mere touch of a button, requiring no attention until your food is ready to be removed from the smoker. Our pellet smoker reviews will help teach you about pellet smokers. We will cover what they are, how they work, and what features you'll want to look for when choosing the best pellet smoker for your backyard. 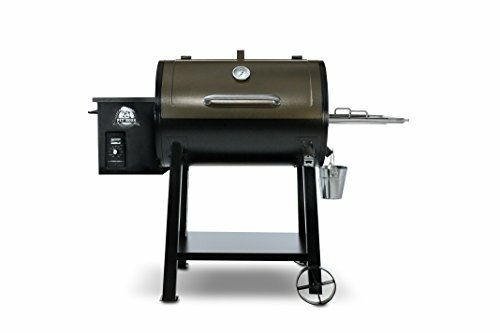 What Features Should I Look For In A Pellet Smoker? Fully featured and big, the Rec Tec wood pellet smoker can tackle most needs at home. REC TEC smoker neatly ticks off all of our required features - excellent electronic temperature control and easy to clean stainless interior panels in a no frills package. This smoker is sturdy, not fancy, and it shows. It seems more robust and solid than many of its competitors. The temperature control is accurate actively adjusts the heat based on an internal thermometer. However, it might alternate between several degrees too hot and too cold at the lowest setting until the unit warms up and adjusts. It's also big. Like, really big. The 700+ square inches of cooking space make this one of the largest models we've seen. While this means it takes up more space, it also means that you can cook just about anything on it from a full rib roast, several chickens, and a few ﻿﻿sausag﻿﻿es fit comfortably at the same time, with a bit of room to spare. REC TEC has slapped on a 40 lb hopper to fuel all of this, which means you won't have to remember to change out your pellets in the middle of cooking. The robust construction affords some tangible cooking benefits. This smoker can hit temperatures of nearly 500 degrees on its highest setting, high enough to sear a steak or fire a pizza. It's hardly affected by outside wind, meaning you can BBQ anytime you'd like. Finally, it comes with a 6 year warranty covering all major (non-cosmetic) damage. Check out the ﻿REC TEC Wood Pellet Smo﻿ker on Amazon. For low temperature smoking, this Bradley Digital unit offers an impressive, convenient package. Okay, so this is not a pellet smoker. It uses bisquettes, which are a functionally similar but different in name, shape and size. Instead of being fed by an auger, the fuel is forced down a tube by gravity. Still, it's an impressive smoker.If you don't intend to jack your heat up to more than 300 degrees or so, and you understand the difference in the fuel type, give it a gander. The inside of this unit is different than the other pellet smokers we examined. It's lightly insulated. It's quite similar in design to a refrigerator, if that makes any sense. It's vertical, it's got racks on the inside, and the insulation means that it resists outside temperature changes. Since it leaks less heat, the temperature controller needs to do less work, and it can concentrate on delivering flavorful, low-heat smoke to your food. It doesn't need to be super heavily insulated, since there's a constant stream of heated smoke being pumped in anyway. You can't get this unit super-hot. This isn't a real problem for BBQ or smoking since you'll be cooking at around 300 degrees max anyway. If you want to grill things or fire a pizza, you may want to consider another unit. You need to load at least four bisquettes into the hopper for this to begin smoking (it needs the push of 3 log things to actually burn the fourth). This isn't a real problem, but does take a bit of getting used to. If you're willing to use bisquettes instead of pellets and you want a vertical, low temperature smoker, the Bradley Pellet Smoker might be for you. 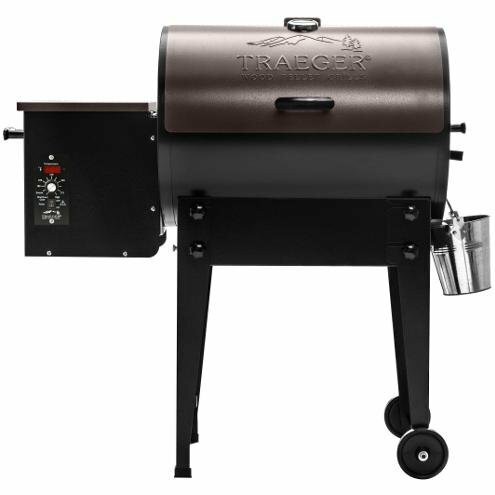 Traeger is a popular brand in Barbecue and Grilling and offers this medium sized smoker with features you need to make smoking simple. Weighing in at 292 inches (less than half of the REC TEC), this unit is still more than large enough for most household use. You won't cook for 40 and have leftovers, sure, but you can comfortably fit a rack of ribs or plenty of small poultry items on the cooking surface. This unit has a fully featured electronic control unit, complete with auto-start. The temperature control is accurate and works great. Smoking is a total breeze. Cleanup can be a pain, but not any more than most of the other wood pellet smoking units. Traeger is one of the industry leaders in BBQ equipment, but reports indicate that their quality control has been somewhat suspect lately. Before purchasing this unit, be sure to investigate warranty options and find your local repair shop. There's a pretty good chance you won't need either, but it never hurts to be prepared. If you're looking for a medium sized smoker for your backyard, the Traeger Pellet Smoker might be the choice for you. Camp Chef include a number of amenities with this model to make sure that your smoking experience is as pleasant as possible. This is a medium sized smoker. While the vertical headroom is nice, the 560 square inches it advertises include a small (~150 cubic inch) smoking rack on the inside. You can totally load it up with food on both racks, but it'll still feel much smaller than a big unit like the REC TEC. The digital temperature control is great with its high and low smoke settings, a built in meat probe for exact cooking, a cool-down function, and even a pellet prime button to charge the auger. The control chip is set up with a feedback loop, meaning that it'll adjust for outside temperatures when adjusting heat. Camp Chef has done their homework when it comes to ease-of-use features. There's a trapdoor for easy cleaning and emptying of the burn pot. There's an included cookbook with lots of recipes to give you an idea of how to get started. Finally, there's a library of helpful videos available on their website specifically dedicated to assembling this product. The only potential downside is Camp Chef's lackluster one year warranty. Other brands offer 5+ year warranties on their models. If you're worried about your investment, consider purchasing a 3rd party warranty. 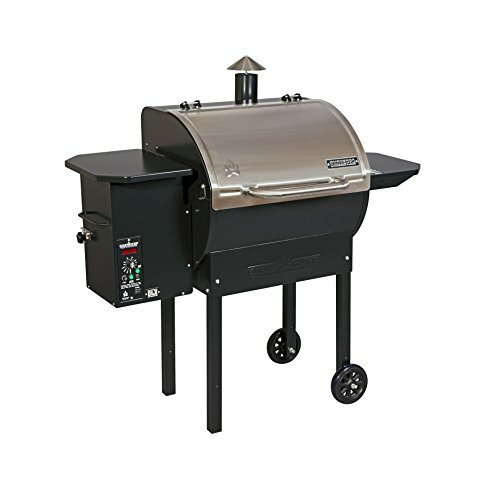 This no-frills smoker is perfect for a backyard BBQ and is available in two different sizes. The digital temperature control of this smoker isn't as fancy as the competition, but it still gets the job done. A temperature probe with a clear, exterior readout helps gauge exact cooking times and lets you know when your food is done. Like the other grill models we looked at, this unit can heat up to 500 degrees, giving you a full range of cooking options from smoking to searing. Pellets tend to impart less smoke flavor at higher temperatures, though, and they're a bit more expensive than propane, so you might want to hang on to your old grill for everyday cooking. This Pit Boss is sturdy and easy to assemble in about an hour. The wheels aren't the greatest, however. If you anticipate moving it around a lot, consider heading over to the hardware store to pick up a different set of wheels. It's pretty easy to change them out. With a copper embossed finish, a built in can opener, and a handy bucket hook, consider the Pit Boss Pellet grills. Wood pellets are made from compressed sawdust. Because sawdust is created as a byproduct of working with wood, it's really cheap even for types of woods that would normally be very expensive. Wood pellets burn very cleanly, too, with very little ash (about half a cup per 10 pounds of pellets). Be wary of pellets made for use with interior heaters. The sawdust used in these can sometimes contain chemicals used to treat woods that are unsafe for use in foods. Use wood pellets that are specifically made for pellet smokers and grills. Wood pellets are available in a variety of blends. Special food grade wood pellets are still very inexpensive compared to raw wood (about $1/lb. at the time of writing this article). Wood pellet smokers are incredibly convenient, but some connoisseurs think that they don't put out enough smoke. If you really want to kick up the smoky taste in your food, here are some things to try. First, be mindful of your temperature. Wood pellets give off the most smoke at lower temperatures. For extra flavor, consider setting your smoker to 250 F or lower. Second, be mindful of airflow. Heat and air propagate through your smoker in different ways. Just because your roast gets hot doesn't mean that smoke is actually touching it. Try a few different positions to see which ones get the most flavor (in most models, you'll find it's the upper rack). Finally, remember that smoke sticks to cool, wet things. Consider throwing in your meats when they're still cold and basting or spraying them with apple juice, mop sauce or even water as they cook. You want a smoker that's big enough on the inside to cook what you want, but small enough to not take up your entire yard and still leave you enough space to maneuver around it safely. Cleaning a wood pellet smoker is complex. 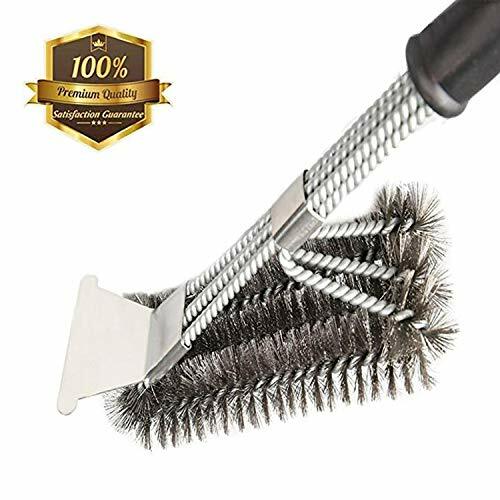 Cleaning the heat deflector is usually a half-hour process. It involves removing a couple metal plates, scrape off a bunch of grease, and then put them back together. Removing ash from the burn cup can also be complicated, since very few models feature slide-out cups. This means you might have to disassemble your unit and poke around with a vacuum hose to get it clean. 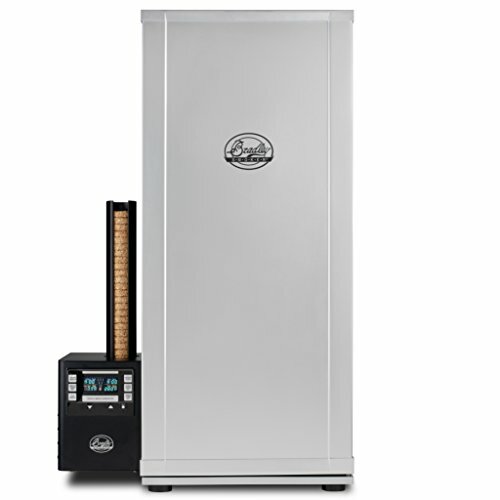 One of the primary advantages of a pellet smoker is the ability to accurately set the temperature. Make sure that the unit you're buying allows you to do this: you want a temperature probe inside the unit, an electronic controller, and the ability to actually use it. Don't settle for something with just a "low, medium and high" setting.